(August 2015, by Nico Daams) After some years of low activity, the Niuafo’ou project (Kingdom of Tonga) is off to a new start. During a meeting of the translation committee on July 29, 2015 the committee decided to first complete the Gospels, and publish them in 2017 as a separate publication. This initiative came from Rev. Folauhola. He feels – and they all agreed – that it will give a shorter time to get a part of the Bible published in their language. So the team will stop making first drafts and focus on the Gospels. These have all been translated a long time ago, so now the translators are going to check each other’s work. They set up a roster listing who will review which book. They also decided to meet twice each month on Saturday at the BTO Tonga conference room. They will work on reviewing the Bible books assigned to them but will also be able to share what they have learned about their language, what words to use etc. This will greatly increase their progress, along with definite goals: finish the peer review by the end of this year, finish the community review and the consultant check by the end of next year, and publish the Gospels in 2017. 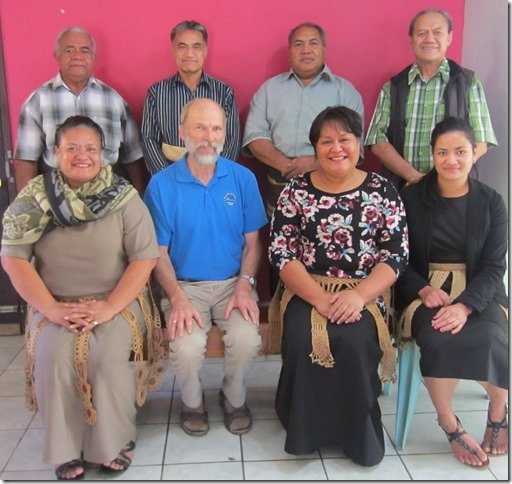 During this trip I have found the Bible Translation Organisation of Tonga (BTO Tonga) to be really keen to be involved in the Niuafo’ou translation project and one idea emerged. They have made their conference room available to the Niuafo’ou team for their meetings, and even more significantly, they agreed to let one of their staff members, Kalolaine Tu’ipulotu, assist the Niuafo’ou translators whenever they run into problems with their computers or with the Paratext software they use. This will be a great help to them and to the project.